There have been a lot of changes in the 3D print market in the last year. Some new printers have come out that are really capable at a very affordable price, and there are some that have been discontinued. It’s important for an update and a rundown of some of the best 3D printers under $500. There are a lot of good options for a 3D printer under $500 if that’s your market. Whether it’s for you personally or a gift or even for school, you don’t have to spend a fortune to get into it. The 3D printers that are mentioned are ready to go out of the box and don’t have to be assembled. 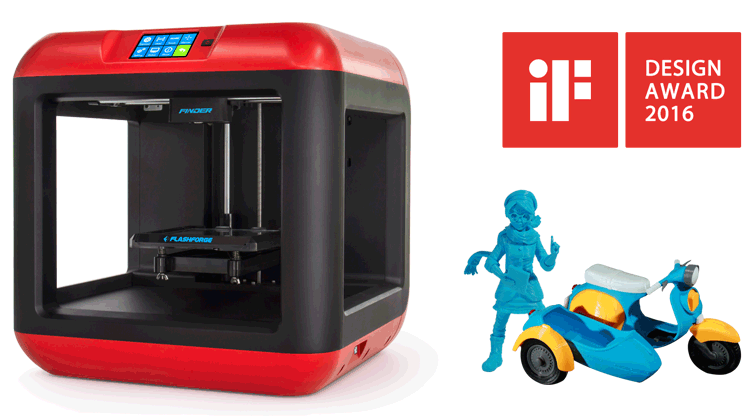 Listen on to check out 3D printers under $500 or even the best 3d printer under 300. I was doing some research for this episode on the best 3D printers under $500 when I discovered the unfortunate demise of the Polar3D Printer. I felt that it was important to do a rundown of what I think are the best 3D printers under $500 that are available today in the market because there’s been a lot of change in the last year. There’s some new printers that have come out that are capable at a very affordable price. As I discovered, one of the printers we thought was one of the best at an affordable price, the Polar3D, no longer is available. It’s time for an update and to rundown some of what we think are the best 3D printers under $500. I want to make it clear I’m not putting any kit-related printers here. All these 3D printers that I’m going to talk about are actual out-of-the-box assembled other than removing packing material, configuring and installing whatever software you need, they’re there ready to go. You’re not going to have to assemble a printer. We might do something like that in the future because there are a lot of new kit printers that look pretty cool and there’s some merit in doing that depending on your situation but for this episode, we’re talking about printers that are ready to go out of the box and don’t have to be assembled. The first couple I’m going to talk about are ones that have been around for awhile. The da Vinci Mini and the da Vinci Junior 2.0, then there’s a third one. da Vinci has three and that’s why I’m talking about them altogether. It has the da Vinci miniMaker. All of these are better than decent, entry-level 3D printers. Let’s start with the oldest one. I did a review of this one, the da Vinci Junior 2.0. It is out on the street for less than $450. One of the big things that is a big differentiator with the da Vinci Junior 2.0 is that the 2.0 is also called the 2.0 Mix. It’s a big distinction from the other 3D printers that I’m talking about in this episode. This 3D printer allows you to put two colors of filament into one nozzle and allows you to blend them. 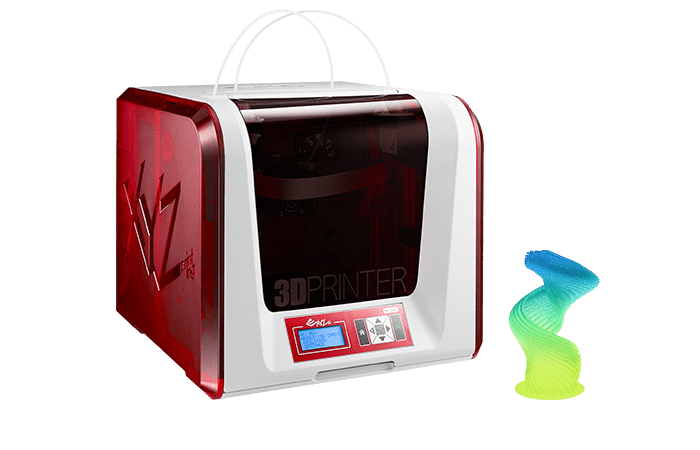 3D Printers Under $500: da Vinci Junior 2.0 allows you to put two colors of filament into one nozzle and allows you to blend them. There’s no other 3D printer that lets you do that under $500. This is the only one that’s out there that would even attempt this. All the other 3D printers have just one nozzle and put one filament into them. This one you can put two. There’s a limited amount you can do with that on this type of 3D printer, but certainly you can do blends and gradients, and that’s a nice different feature. I always wanted to be able to use more than one color filament in my 3D printers almost like a month or two after I started working with the first single color machine I ever had. For what is under $500, that’s an amazing feature and sets this 3d printer apart from everything else. That’s an important thing to note. I want you to be aware of that. The da Vinci Junior 1.0 even you can find for $249. Some of the big differences between those two are whether it’s Wi-Fi or not and some of its technical capabilities. The da Vinci Junior was a fantastic printer and did a very good job. It has a very small build plate, as long as that build volume will meet your needs. It’s certainly a very good printer, especially for the beginner to get started on. It did have some unique aspects. Their filament spools have a chip in it. I’m never a big fan of proprietary filament, but it was pretty easy to hack and get around. The da Vinci Mini also is a worthy printer, very easy to use out of the gate, does not have a lot of complex assembly to get going, and you can definitely accomplish a lot with that printer. That one tends to be on the street for about $199. The manufacturer suggested retail price is $289, but either way a pretty affordable printer. Then there’s the da Vinci miniMaker, which is probably the most entry-level of da Vinci’s 3D printers that’s marketed toward kids. It’s got a very fun primary color palette, red, yellow and green, and a little bit of primary blue in there as well. While it’s geared toward kids, it’s not only for home use. It’s a decent one that teachers can use. At that price for around $200, you can hardly go wrong even if you outgrow it before too long. It’s got a plug and play set up and you can be up and printing with this thing in half an hour, 45 minutes from getting it out of the box. I am not going through in rating these printers. They’re all worthy candidates for you to choose as an entry-level 3D printer. I’ve never been a big fan of rating things on a scale of one to five or a scale of one to ten, because every printer is intended for different purposes and different situations. A printer can be better for one person or another, so I’m not going to do anything to rate them specifically, like force-ranking them. Some of the considerations would be the overall size. The da Vinci Mini is a bigger footprint printer, like on your desk, your table, or your workbench. It’s essentially sixteen inches cubed, a little over that, but roughly sixteen inches cubed. The build area is 6x6x6. When you get to the da Vinci Mini and the miniMaker, the build area is a little smaller, but that’s okay given the price point drops and the entry level nature of these printers. All these printers have decent resolution down to 100 microns, there’s a couple on this list that have even down to 50 microns. I would advise each you regardless of which printer you might be interested in to go out and look at the specific specs and then make your own decision. All these are capable for printing a great variety of things and certainly anything that you’re going to want to do as a starting person in your 3D print journey here. 3D Printers Under $500: Flashforge Finder has a removable build plate, not all of these entry-level printers have that, so that sets this one apart. Moving away from the da Vinci series, another one which is impressive is from Flashforge, the Flashforge Finder. It’s another one that is inexpensive. You can find that on the street for about $399, just under $400, the SRP is under $500. 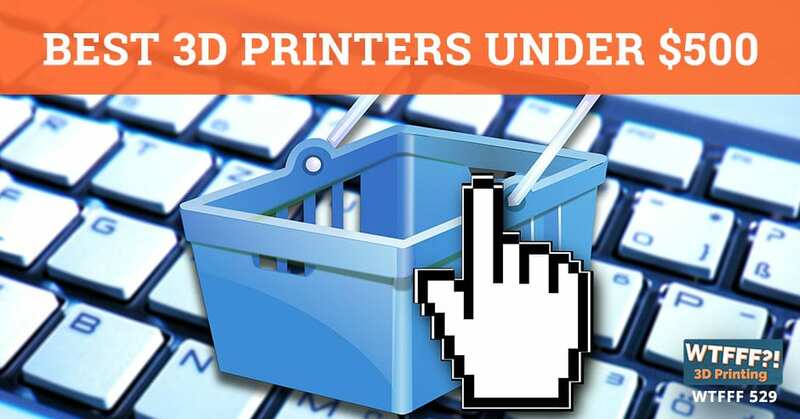 This is one of the highest priced ones in this round up of under $500 3D printers. The design of this one is really well done. The industrial design of this is impressive. It’s also got a full-color LCD display on the front of it for operating it. That’s a feature a lot of times you don’t see unless you have printers that are a thousand dollars or more. Generally, you don’t see certain things like that. This printer tends to run pretty quietly. The touch screen interface is impressive and it’s got Wi-Fi, which you would expect on printers that are more in the $400 to $500 range. The da Vinci Junior 2.0 also had Wi-Fi, the one that we reviewed. Some of the cheaper ones can’t afford Wi-Fi for the less expensive price. Another interesting thing about the Flashforge Finder is it has a removable build plate, not all of these entry-level printers have that, so that sets this one apart. This is definitely one to consider as long as you’re okay spending up to the high end of the range of these printers that I’m talking about. Now I’m going to go to a new entrant into the field and that is one called GeeTech E180. It is another very impressive 3D printer. None of these are kits. This one, pull it out of the box and you’re ready to set up and get going. It’s clean. It’s got this nice overall white and black aesthetic going on. It looks quite European. This printer is on the street for under $300, $298. It’s impressive. This 3D printer could be in a roundup of the best 3D printer under $300. It was originally a Kickstarter, but now it’s available. It survived Kickstarter and got out to the world as a real 3D printer, manufactured, that anybody can buy. 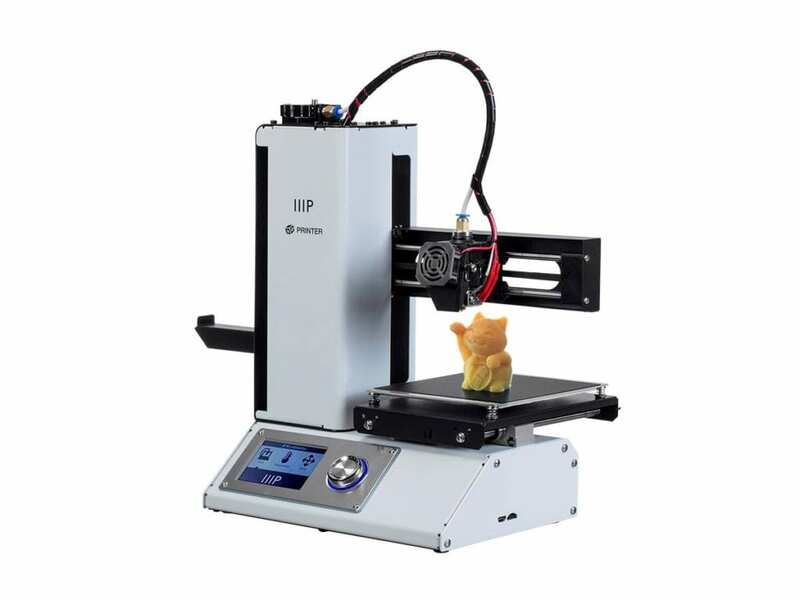 It’s not only assembled, but a considered a plug and play 3D printer. It doesn’t require a lot of calibration. It also has a cloud-based 3D printing app. You can have that app on your phone and be able to monitor the printer and all these stuff. It’s pretty impressive, seems to be very capable, a good entry-level 3D printer. Moving on is another relative newcomer to the scene, and this is a very interesting company. I’ve seen a few printers out by them, but it’s called Monoprice. It’s a Monoprice Select Mini V2. It’s been around a little longer because there had to be a version one. This printer is priced very similarly to the last one I mentioned, $296 available to be purchased. It’s another one of these impressive and inexpensive 3D printers. In a lot of ways, these last two are similar in their configuration and their function where they each have a build plate that moves in one axis. The head of the printer, the nozzle, ends up moving in the other axis, so the build plate will go in the Y-axis and the head will go in the X-axis, but the head also moves up and down to the Z. That’s true to both of the last printers I was mentioning and more of an open architecture. I have to say that the Monoprice Select Mini looks like it’s made more of a designed fabricated sheet metal. There’s nothing wrong with that, but the GeeTech E180 that we talked about before is a little more of a refined product. It’s got injection molded plastic exterior that’s a little more intentional. It’s color LCD screen is a little brighter and a little larger, but both of these printers, they’re similarly priced and similarly capable and in the same vein, in the same class of an entry-level 3D printer. 3D Printers Under $500: Monoprice 3D printer has a micro SD card to be able to pull files off of and print from. That’s a nice feature that I’ve always liked on 3D printers. One of the things that distinguishes the Monoprice 3D printer is that it has a micro SD card to be able to pull files off of and print from. That’s a nice feature that I’ve always liked on 3D printers and I often find some of these entry-level 3D printers don’t have that type of thing. While others are trying to do everything through the cloud and I understand there’s some simplicity in that, I like the ability for a printer that has a micro SD card removable. To me, that’s worthy of mentioning on this printer and something worth considering and making sure you understand that that’s a big distinction here. The last 3D printer that I’m going to mention here in this round up of under $500 3D printers is a Delta 3D printer. 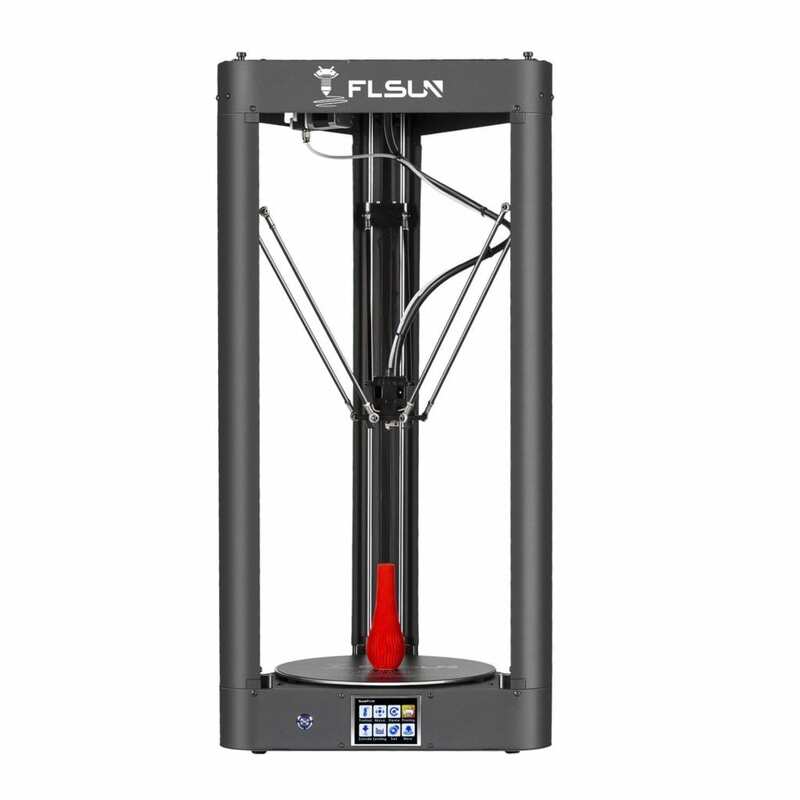 I thought it was important to include at least one Delta in this roundup and that one is an FLSUN Pre-Assembled Delta 3D Printer. It looks like it’s a pretty robust machine that appears to be made of stamp sheet metal and assembled. Delta printers are all pretty much the same in their function, impressive little machines in their simplicity. This one has a round build plate which makes a lot of sense being a delta. There are a lot of great things you can make. Certainly when it comes to build volume for the price in terms of the height, on a Delta, you can’t beat that. The build volume on this printer is going to be 260-millimeter diameter or 26-centimeter diameter and a 37-centimeter or 370-millimeter height. That height blows away any of the other printers that I’ve mentioned. No other printer has near the height build volume. That’s the nature of a Delta printer. It’s pretty inexpensive to make it taller, but this printer for $489 on the street has Wi-Fi, has an LCD touchscreen. One thing I do want to mention, it is called a pre-assembled, it is considered a pre-assembled. I wrestled with this whether to include it or not because it barely qualifies as a pre-assembled but like a lot of products in this world that are tall, that require a little bit of user assembly because otherwise you’re shipping a whole lot of air in a big box and it becomes prohibitively expensive, they say this one’s 95% assembled. It’s not considered a kit 3D printer though. 3D Printers Under $500: When it comes to build volume for the price in terms of the height, on a Delta, you can’t beat that. All this is because the Delta, you’ve got your three vertical elements that make the structure between the top and the bottom and they’re decoupled, meaning you set up the base, you set up your three vertical columns at the corners, and assemble the top to it. I consider that like assembling a piece of furniture that you buy or something. It’s flat-packed to save on cube and make it affordable. I don’t consider that to be a kit printer as a result. Some of you may disagree with me and that’s fair if you do, but I thought it was worthy of including at least one Delta printer in here, the one that is not considered a kit and is available for under $500. The reality is there are a lot of new entrants in this field. There were three, maybe four 3D printers that I talked about here that have existed for quite a period of time and have stood the test of time, which is great. Some new entrants, some Kickstarters, and some Asian companies coming in and offering some new options. What I’m happy to see is that there’s a lot of options out there at a very low entry-level price point that do not require you to put a kit together and learn to program and all that. There’s a merit to that, I’m not knocking that, but for a lot of people that want to learn about 3D printing, not about how to build a 3D printer, there’s a lot of inexpensive options. I remember I had a friend who asked me, “I wanted to give a 3D printer for my kid. What would you recommend?” There were very few that I could recommend at that point that were new 3D printers that weren’t a kit that I thought had decent quality and ease of use. Now, that’s changed. There’s a whole bunch of them. This is good news. There’s a lot of good options for the best 3d printer under 500. If that’s your market, whether it’s for you personally or a gift even or for your school, you don’t have to spend a fortune to get into it, so I’m happy about that. Thanks for listening. Please leave a comment at 3DStartPoint.com. If you have something to share or maybe there’s another printer you think I should’ve included that I didn’t, I’d love to hear about that and consider that. If you want to share anything with us, you can reach us on social media anywhere @3DStartPoint. Thanks so much for listening. I do appreciate it. I’ll talk to you next time. This has been Tom on the WTFFF 3D Printing Podcast. Just so you know, I’ve had my hands on 2 Geeetech E180s, and I’ve only got one running because I’ve used parts from both of them. That machine, and every machine I’ve gotten from Geetech, is crap. Do not recommend them. Avoid them at all costs. The Monoprice Select Mini, however, I can not recommend highly enough. Solid metal construction, preassembled, you just unpack, level the build plate, and you’re printing. Less than 15 minutes. And I know because I’ve done it 8 times. I can not get enough of these printers. DaVinci makes good machines, but they tie you to their chipped filaments or their machines don’t work. That’s not a bad thing, just something to keep in mind. It means that you’re getting a better printer at a lower cost than perhaps even cost, but you’re paying for it over time with increased filament cost. Great insights – for those of you who don’t know Joe Larson, he has a fabulous YouTube channel with lots of videos and tests of 3D Printers. https://www.youtube.com/user/mrjoesays Joe – we should do a new interview soon and get your insights.